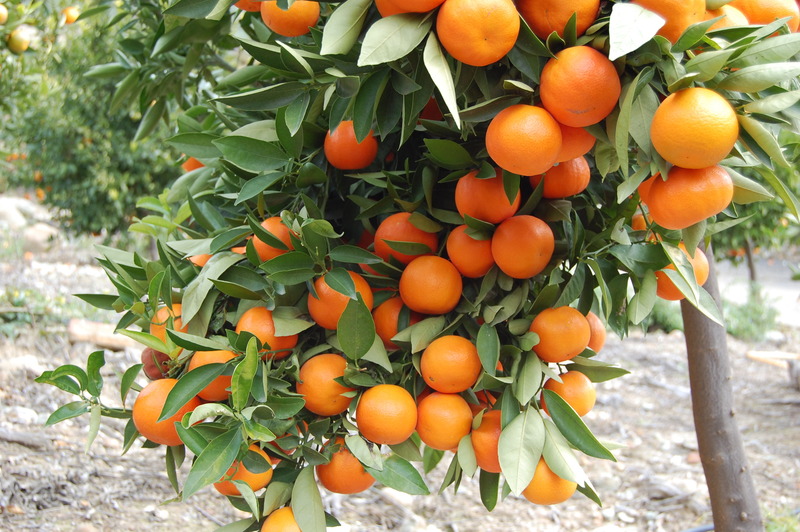 RIVERSIDE, Calif. – Citrus researchers at the University of California, Riverside have released a new mandarin (or tangerine) for commercial production. Named ‘DaisySL’ for Daisy seedless, the new fruit is finely textured and juicy, with a rich, sweet and distinctive flavor when mature. Its rind is smooth and thin, and bears a deep orange color. Williams, who supervised the planting of the trees and performs evaluations and selections of promising varieties, noted that ‘DaisySL’ had the right characteristics he and Roose were looking for in a new variety: beautiful appearance, exceptional flavor and hardly any seeds. “‘DaisySL’ is similar to many other selections we evaluated, but it stood out from the rest, and we knew right off that we had something special,” Williams said. Still, he and Roose continued their evaluations of ‘DaisySL’ and waited eight years from when they saw the first fruiting on a single tree to announce it as a new variety ready for UC Riverside to release. 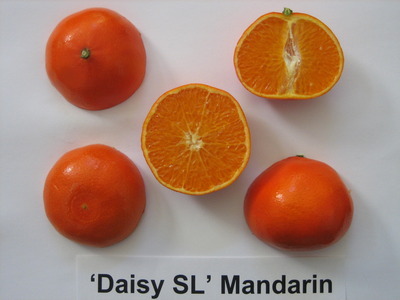 Roose and Williams developed DaisySL from an irradiated bud of the seedy diploid mandarin cultivar ‘Daisy,’ a mid-season maturing variety that is a hybrid of the mandarins Fortune and Fremont. As is the case with most citrus trees, ‘DaisySL’ was asexually reproduced by grafting of budwood onto rootstocks. After starting a mutation breeding project like the one that led to ‘DaisySL,’ it usually takes citrus breeders four to five years to identify a promising selection with the desired traits on an individual tree. Breeders then establish many trees of the selection and subject them to trials in differing climatic areas to evaluate fruit quality, tree growth and production – a process that takes at least three additional years of fruiting. Once UCR breeders were convinced of the potential of ‘DaisySL,’ the university released the variety, more than ten years after the first tree was produced. In September 2009 UCR will release ‘DaisySL’ for propagation by California citrus nurseries that have purchased licenses to propagate and sell the variety in the state. The citrus breeding project that developed ‘DaisySL’ is partly funded by California citrus growers and nurseries through the Citrus Research Board and California Citrus Nursery Board. Distribution of ‘DaisySL’ is limited to California for three years after release. Roose and Williams estimate it will be five years before the first ‘DaisySL’ fruit arrives in grocery stores. They explained it takes one or two years for the industry to make enough budwood for commercial budding, another year to produce a tree, and an additional two to three years to produce the first fruit. UCR’s Office of Technology Commercialization filed for a U.S. patent for ‘DaisySL’ in June 2009. The ‘DaisySL’ fruit averages 2.7 inches (68 mm) in diameter and about 2.4 inches (60 mm) in height. Each fruit has 10-11 segments and a semi-solid axis of medium size at maturity. The fruit is juicy, averaging 47 percent juice, and weighs 135 grams on average. It averages 2.2 seeds per fruit in mixed plantings with other citrus varieties (in more uniformly varietal commercial plantings, a lower seed content is expected). UCR has a long tradition in citrus research. In 1907, the University of California established the Citrus Experiment Station at the foot of Mount Rubidoux in Riverside to support Southern California’s growing citrus industry with scientific data to improve production. In 1917, the station moved to what is now the A. Gary Anderson School of Management. The station became the foundation for the UCR campus, which opened in 1954. Now known as the Citrus Research Center-Agricultural Experiment Station, the work of the center has grown to include all aspects of agricultural production in arid and semi-arid subtropical lands. Research on citrus production and development of new varieties remains a major focus of UCR agricultural research. UCR is home also to the University of California Citrus Variety Collection, consisting of two trees each of more than 1000 different citrus types. Used extensively to solve citrus disease problems and improve commercial varieties, the collection is one of the world’s premier citrus germplasm collections. Caption for video below: Citrus researcher Mikeal Roose talks about developing ‘DaisySL,’ a new citrus variety released by the University of California, Riverside. Video credit: J. Warnert, UCOP. Fruit of 'DaisySL.' Photo credit: T. Williams, Roose lab, UC Riverside.